Updates @ 8:20 am on 2-3-2013: The estimated arrival time of the remains of the two fallen heroes is at 12:00 noon today at TUDM airport, Subang. It did not matter who started to shoot first. We shouldn’t be wasting our time with such senseless debate. The 180 Pilipino terrorists (30 were heavily armed) should not have invaded our country with heavy arms in the first place. Even if a foreigner who came into Malaysia legally but with arms, he or she will be automatically classified as a terrorist. Malaysia is no different to America and other countries. On 9-2-2013 180 heavilly armed Pilipino terrorists inviaded Lahad Datu, they have no valid excuse to hide behind their claims whether they were legitimate or illegitimate. These terrorists have been lucky that the Malaysian Government has been extremely kind and patient to them by spending 17 days using diplomatic channels and others to persuade them to surrender and leave Lahad Datu. But these terrorists saw it fit to test the patient of Najib Government and misconstrued it as weakness. It has been reported in the News last night that upon hearing that two of our VAT 69 commandos have been killed by the mortar shell launched by the terrorists, YAB Datuk Seri Najib gave the green light to PDRM to act accordingly. It has also been reported that 12 terrorists have been killed by our forces. A job well done. These terrorists should have been wiped out totally. The question now is: Where are the remaining 168 terrorists? If they were arrested, they must face the full might of our laws and the consequences. If caught alive, they should be charged for wagging war against the Yang di-Pertuan Agong (i.e. Wagging was against the State) under Section 121 of the Penal Code. Whoever wages war against the Yang di-Pertuan Agong or against any of the Rulers or Yang di-Pertua Negeri, or attempts to wage such war, or abets the waging of such war, shall be punished with death or imprisonment for life, and if not sentenced to death shall also be liable to fine. Whoever abets the commission of any of the offenses punishable by section 121A or 121B shall be punished with the punishment provided for the said offenses. Whoever knowing or having reason to believe that any offence punishable under section 121, 121A, 121B or 121C has been committed intentionally omits to give any information respecting that offence, which he is legally bound to give, shall be punished with imprisonment for a term which may extend to seven years or with fine or with both. We should remember the case of Mohamed Amin Mohamed Razali, who led a band of 29 Al-Ma’unah men in a mission to overthrow the Malaysian government in 2000. The said Mohamed Amin Mohamed Razali was found guilty under Section 121 and hanged in Sungai Buloh prison on 4-8-2006. Please read HERE. If these terrorists were to invade other countries like America, Israel, UK and others, yours truly is as certain as tomorrow sunrise that it will be all over in a day or two. It will be a case of “bodies back” with no negotiation whatsoever. “Another Philippine military officer said the men were followers of the heirs of the Sultan of Sulu – an island group off the southern Philippines – who had been invited to Sabah by a Malaysian opposition politician to discuss land issues.” This was reported by Reuters in HERE. The said Reuters’ report that these terrorists have been invited by a Malaysian politician to Lahad Datu for discussion had to thoroughly investigated and if it was true then drastic actions had to be taken against the politician responsible. It is all about patriotism and treason. Section 121 of the Penal above is also applicable in such a case. In view of the above, yours truly calls upon the Government to have an in-depth investigation into this Lahad Datu standoff involving 18o foreign terrorists. 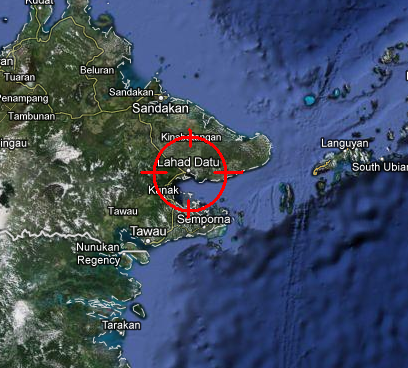 All Malaysians, especially those living in Lahad Datu, must be elated that the stand-off was all over today. We are grateful to our security forces for defending our sovereignty against the aggression by these terrorists. It was most unfortunate that two our Vat 69 (UTK – Unit Tindakan Khas) commandos had to be the fallen heroes in defending our sovereignty. Yours truly would like to send condolences to both families of the fallen heroes and may their souls rest in peace. The whole nation is proud of both of you. Yours truly heard that the remains of the two heroes will be arriving in TUDM in Subang at 9:30 am today (2-3-2013). Lets all be there to show our support and appreciation to both of them and their families. SINCE WE KNOW WHO HE IS , WHy IS THAT TREACHEROUS TRAITOR MOTHER F STILL ARROGANTLY PRETENDING NOTHING HAPPENED ? WHY NO ACTION TAKEN ON HIM? An… COMMITTED TREASON AGAINST OUR BELOVED MALAYSIA! Who was that opposition politician? Please be brave enough to stand up to be counted. Stop pretending to be righteous. Bloody hypocrite! Mr Seng Lee, WCK was quoting a news report by Reuters and Reuters also did not mention the name of the opposition leader[s]. You are acting like a dog that barks at a wrong tree. Why don’t you challenge Reuters to name that opposition leader. It is going to be a bitter pill for you, i guess. Btw, you sounded angry and stupid at the same time. Why were you so upset??? YB or Seng Lee did not mention Opposition Leader but opposition politician as stated in the Reuters’ report. But you yourself mentioned the Opposition Leader. Aiyo! Siapa makan cili terasa pedal!!! It is all up to the opposition politician or as you put it Opposition Leader to clarify if they have got the guts to do it. I am sure that the Opposition Leader will start to sue in order to distract attention like what had happened in other cases. Then he will withdraw the case before the trial begins. Just his suit against Khairy Jamaludin. Don’t have to be so upset. You are showing your color now. You are showing that you and the opposition are panicking now because YB has laid down the ground work on “wagging war against the Agong” and the Section 121 of the Penal Code. It is going to be fun from now on. I waiting to watch the show after the Lahad Datu dust has settled. zulzab, you better pray for your pemimpin anugerah tuhan! Why just to the conclusion? YB did not refer to your dear Opposition Leader. You must be guilty conscious. We all know who are involved in this episode. Who ever were involved should be shot. T kasih YB..YB contoh Ahli Politik yg prihatin terhadap Negara..
Benar tiada soal jawab dalam mempertahankan kedaulatan Negara kita, kerajaan mesti cari dan hukum mereka sekeras-kerasnya biar pihak-pihak yg cuba mempermainkan kerajaan menerima padahnya. Cari siapa Ahli Politik yang sanggup mengadaikan maruah negara demi cita-cita politik buruk sangka mereka!!! Demi pertahan kedaulatan Negara..rakyat akan bersama pasukan keselamatan Negara untuk sama-sama berjuang pertahankan setiap inci tanah yang berdaulat ini!!! I am sure no action will be taken by our government base on that report ,even there is a little proof but not enough proof to bring to court of justice . In time like this we missed ISA. Why is the government waiting for? Just move in and wipe these terrorists/intruders out once and for all. Let it be a lesson to these group of terrorists/intruders or their sympathisers. Who is the opposition politician involved? there must be a thorough investigations into this matter as it involves treason. Just finish them off. We don’t have to put up with these terrorists. My hearfelt condolences to the families of those who died in the course of defending the Nation. But the question that came to mind is that why are the Authorities slow in responding to the situation. These intruders came with premeditated bad intentions and heavily armed. There should be no room for negotiations. They should be blasted to the deepest hell right from the beginning. 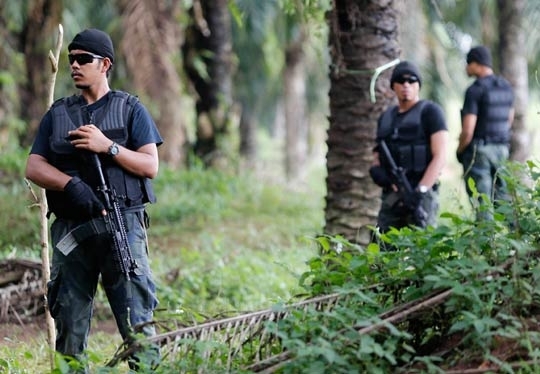 Now the intruders have time to strategise their defence and it will be a tough battle for our Armed Forces.Why is our border so porous…..have we not learnt from past incidents when armed men robbed a bank in Lahad Datu and the taking of hostage from Pulau Sipadan. Can YB take the lead and get some Parliamentarians and non-Malay groups to lay some flowers for the fallen at the National Monument? Our armed forces and police need to know that all Malaysians are behind them and recognize their sacrifices. All this politicking is really too sickening and we need to heal the widening division before it gets out of hand.